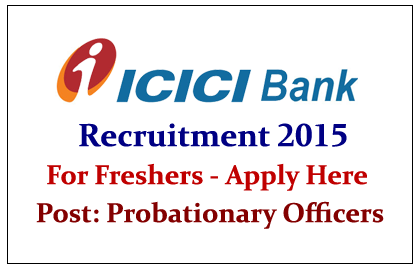 ICICI Bank has announced recruitment notification for Probationary Officers of November 2015& February 2016 Batch. Eligible Candidates can apply for this post on or before 30thJune 2015. Any degree with 55% of marks in recognized university. Shortlisted applicants will be invited for the selection process; candidates will be selected on the basis of the performance in the online examination, GD and personal interview. Eligible Candidates can apply for this post through online by clicking the link given below or via banks website:www.icicicarrers.com.